Don't Just Transfer Classroom Training to E-learning - Transform! Can you deliver good online training by publishing PowerPoint presentations used in classrooms, as they are, to the web? Certainly not. E-learning must address different learning styles. It needs to facilitate knowledge transfer through a variety of activities. Most of the PowerPoint decks used in classroom sessions contain only around 50% of the actual content taught; the rest is conveyed by the instructor in the form of examples, stories, and elaborations. When you convert these PowerPoint presentations as they are, you miss all the activities that facilitate better knowledge transfer, leading to gaps in the content. So, how can you ensure that your classroom training resources are transformed into effective e-learning courses? Let’s look at some best practices that will help in this endeavor. First, you must identify who needs to undergo the training. Is it the sales force? Remote vendors? In-house employees? This is important as the format of your online learning course will depend on how your learners will access the training material. For example, salespeople are mostly on the move and seldom have time to access technology-enabled learning material sitting at their desks. Mobile learning is the right solution for such learners as they can access training on the go. And for remote vendors, virtual classrooms can be the best way, as it becomes difficult for them to communicate their queries with self-paced courses. 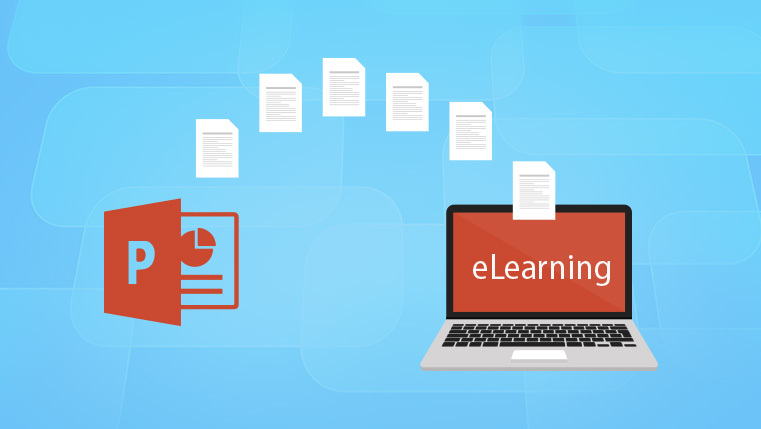 Once you have identified the appropriate online learning format for your learners, you need to gather all relevant classroom training assets such as handouts, eBooks, manuals, Word Documents, PowerPoint decks, learning videos, case studies, evaluation forms, worksheets, and quizzes. Conduct a thorough analysis to determine which of these training assets need to be converted to e-learning courses. You can also prioritize the order in which they have to be converted. There can be many classroom training elements which cannot be “directly” incorporated in online courses. Such elements must be adapted to meet the needs of learners in a self-paced learning environment. For example, role plays are commonly used in classroom training programs for sales reps. You can convert them into interactive scenarios, when you move the training programs online. Many a time, instructors present information in addition to what is needed to achieve the learning objectives, to make the training interesting. Such information is called ‘nice-to-know’ information. You need to identify the nice-to-know information, when you convert classroom training material into an e-learning course, as it does not add value to the course, but increases the duration and cost. Nice-to-know information can however be included in additional resources, in case learners wish to check out. Well-designed classroom training programs use an appropriate instructional strategy, based on the subject being taught. For example, safety procedures can be taught well through practical demonstrations. Likewise, you can teach what constitutes sexual harassment and what doesn’t, through role-plays. When you move your instructor-led training (ILT) programs online, you need to come up with the right e-learning design strategy to present the subject matter effectively. Staying on with the examples of imparting training on safety procedures and sexual harassment, you can use videos for the former, while online learning scenarios are ideal for the latter. Choosing the right authoring tool for e-learning development is important. If the authoring tool you chose does not support your instructional, visual, and multimedia strategies, then it is of little use to you. So, it’s better to create a checklist of your online training development requirements, before choosing the rapid authoring tool. You can refer blogs ‘3 Types of Rapid Authoring Tools for E-learning Development’1 and ‘5 Questions to Ask Yourself Before Choosing a Rapid Authoring Tool’2 which might help you choose the right authoring tool. So, when developing e-courses from ILT material, first identify the best format to deliver the courses. It is important to gather all classroom training assets needed for the conversion and determine which components are to be incorporated in the e-learning, and how you can move them online. Distil extraneous, nice-to-know information and formulate an appropriate instructional design strategy based the subject being taught. Finally, choose the right authoring tool that meets your development requirements, and you are good to go. Hope you liked this post. Do share your views.